Grammy Award winning Canadian singing sensation #Justin_Bieber arrived here early on Wednesday amidst tight security for his maiden concert in India, looking relaxed and geared up to regale Indian 'Beliebers' as part of his #PurposeWorldTour. Fans had been waiting with bated breath for his arrival at the Chhatrapati Shivaji Maharaj International Airport. Bieber came out escorted in a thick security blanket, led by Salman Khan's bodyguard Shera at 2 a.m. He came in a chartered flight along with his crew sporting a pink pullover and black shorts. He was rushed out of the airport, and was quickly whisked off to St Regis Hotel in south Mumbai amidst Z-plus security. The several hundreds of mediapersons and fans, who had parked themselves at various points outside the Mumbai Airport for a glimpse of Bieber, were largely disappointed. 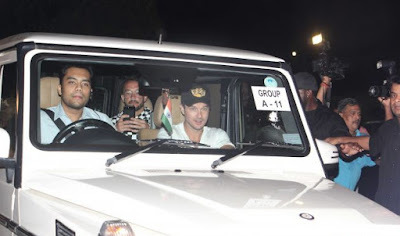 It was earlier speculated that Bieber would land in India on May 8. Later the singer himself piqued the curiosity with a tweet. "Dubai is incredible... India you are next. @Amit_Bhatia99 u ready? Purpose Tour Stadiums," Bieber wrote on early Tuesday. Bieber came to the fore around 2008, promoted by Usher. "Baby" became his claim to fame in 2010 and he garnered a huge fan, which continued to grow with songs like "Where are u now", "Boyfriend", "Love yourself" and "As long as you love me". After rocking the stage in Dubai on May 6, the singer is set to perform in Navi Mumbai on Wednesday. Bieber is likely to fly in a private helicopter to the D.Y. Patil Stadium for his concert, which will first see Indian DJs on stage followed by Norwegian DJ Alan Walker. The concert venue, reported to be fully sold out with over 45,000 seats, will open at 3 p.m. and Bieber is expected to give his performance at 8 p.m., according to the tour organisers, White Fox India. Navi Mumbai Police has deployed massive security, including surveillance by drones for the event. Around 500 police personnel and 25 officers would be deployed for security and emergency disaster management at the venue. The tour is to promote his fourth album, the critically-acclaimed "Purpose", in which he has experimented with more adventurous electronic sounds. Tickets are priced upwards of Rs 5,000, and fans have come from different parts of the country to be a part of the gig. He will be served rich authentic cuisine representing the 29 Indian states. A convoy of 10 luxury sedans and two Volvo buses will be at the disposal of the artiste and his entourage of 120 throughout their stay. To top it, a Rolls Royce has been reserved for Bieber. Even the suite of the five-star hotel where Bieber will stay has been modified to include truly Indian elements. A string of designers have created customised souveneirs for the star, who will be accompanied to India by his mother. Together, they will explore Delhi, Agra and Jaipur after the much-awaited gig.